WOW I neededso long for Vector and I didn't even know why. There are also about 150 Layers, I never needed so much layers for a vector. Something strange happens. When I finished the Outlines I had to reformat my pc and luckily I could save the psd file. I think I wouldn't vector it again so be happy you can the this masterpiece (not really). I used this Image: Maiden of the Lake - Yuuko Thanks for your wonderful scan Marissa! Wow, I'm loving this one Omone-chan! Such a big, pretty vector! Very nice work on the details! Fishys and flowers! XD And Yuuko's hair looks like a lot of fun (heh, kidding!) so good job with that! And nice colours! Yay for Clamp-ness! Keep it up! Great vector! Love the colors! But you could have worked the end of the lines :D if you ask I can teach him to do it <3 great job Omone-chan! do I focus on the pretty people and the pretty colors and the awesome setting? The water effect looks really nice. Unfortunately the edges of Watanuki's Hair, Doumeki's Hair, and Yuuko's looped hair looks pretty jagged, and it takes away from the picture. Some cleaner lines could really make this a nice vector. Very great vector! I like it! Good job! Awesome! I <3 it so much! Gorgeous wallpaper and I love the colour choices. Cool frame too. my god you have so many xxxholic vectors in your gallery, i cant believe you have the patience. and i really want to vector something like this where yuuko's hair is all flowy, my current project features like yuuko in this gorgeous dress but her hair isnt as complex as i woudl like it to be. Ummmm.....I like this one. Watanuki looks delicious, like usual....but can I ask you something? 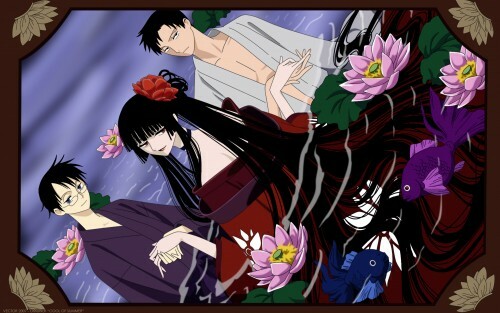 Why is Domeki's...err...robe...not..umm..*tries not to drool*...like Watanuki's? Nice wallpaper, love this one!